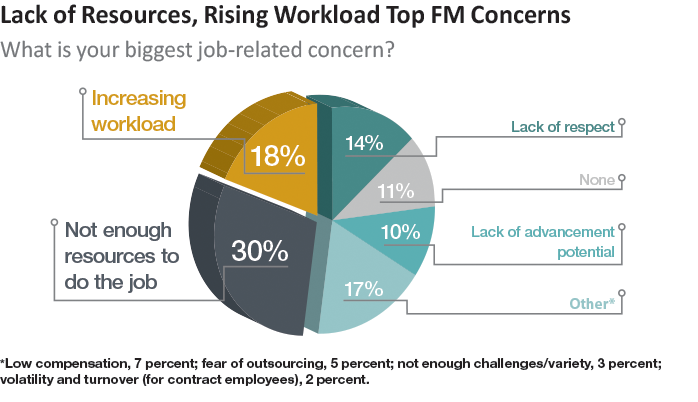 Ask facility managers what their biggest concern about the job is, and the odds are good that the response will focus on not having enough resources or the ever-increasing workload. Those two concerns consistently top the list of challenges that facility managers face, according to Building Operating Management's annual FM Pulse survey; this year, 30 percent of respondents say their No. 1 concern is not having enough resources. And in second place on the list of concerns is increasing workload. So how can facility managers most efficiently do what needs to be done in the face of shrinking budgets and staffs? There's no single answer to that question, but conversations with facility managers who have grappled with that challenge reveal plenty of opportunities to do more with less. "Our reality is it's not easy to do more with less," says Rob Pearlman, head, country office real estate/facilities management for the International Finance Corporation (IFC), a member of the World Bank Group. But it's important to ask, "what's the more that we're doing, and does it make sense? Are there better, more efficient ways to do things? Are there things that we're doing that don't need to be done?" Organizational changes helped IFC's facilities department to take a fresh look at what it does. Pearlman's new boss came into the position with an extensive accounting and finance background. "He's brought a surprisingly fresh perspective to people whose careers have been in facilities management only. He's shaken things up in a positive way," Pearlman says. That's been achieved by his asking questions such as, "Why do we do that? Do we have to do that? Why do we do it that particular way? Could you help me understand what the benefit of that is?" As a result of the organizational change, the facilities unit now reports to finance and accounting — a change that has helped bring about "more efficient ways" of functioning. "The value of what the facilities group adds with their knowledge, expertise, and approach has been more valued under the finance and accounting folks. They appreciate the risks involved with managing real estate." The shift in departmental reporting also meant that the facilities unit could "leverage the use of the financial/accounting people" in doing some of a financial business analysis, Pearlman says. "In the past we've done some of the financial business analysis, but we're not financial people, though we appreciate the value of good business analysis," he notes. Tough economic times add to the pressure on facility departments to do more with less. But that's not all bad news, says Peter Strazdas, associate vice president of facilities management at Western Michigan University. "Every crisis creates opportunities. I always believe in the saying, 'You don't want a crisis to go to waste.'" Strazdas has had the chance to put that maxim to the test. The sharp downturn in the auto industry meant that his state experienced early on the economic shock the rest of the nation felt during the Great Recession. "For good or bad, we had to make adjustments before others were exposed to the economic realities in their respective states," Strazdas says. Information for the survey was gathered through a series of e-mails from FacilitiesNet, the website of Building Operating Management and Maintenance Solutions magazines. Data were submitted during May, June, and July 2014 and included 3,020 responses. Salary and raise information is reported as the median amount. The median is a measure used to indicate a middle point of data. Half who responded earned less than the median, while half earned more. Numbers that are extremely high or low do not distort it. Some charts may not add to 100 percent because of rounding.